You are currently browsing the tag archive for the ‘green assets’ tag. 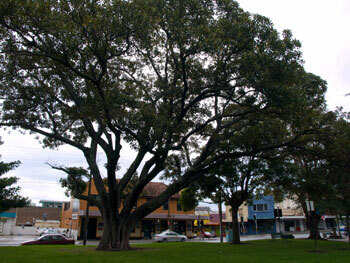 There is an article in last week’s Inner West Courier about Ian Moss, Cold Chisel guitarist & Annandale resident, “saddened by the loss of an 80-year-old tree he dubbed the “queen of the block” in Pritchard Lane after it was poisoned & had to be cut down last week.” The 28-metre (91.8 feet) Eucalypt was growing in the back garden of a nearby property so someone had to sneak in to someone else’s private property to poison the tree. I find this appalling & slightly scary. Imagine not knowing who of your neighbours poisoned your tree. I imagine it would erode any trust or friendship. 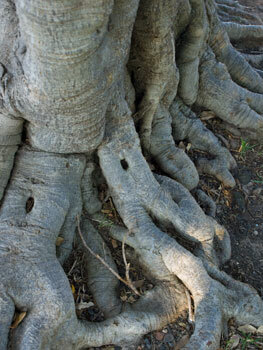 According to the article in the Inner West Courier, vandalism to trees has been growing in the Inner West. The article was also posted on FaceBook, which is where I saw it. After leaving a comment I received the following reply. “According to Marrickville Council there have been 9 requests to Council to investigate reports of tree poisoning in the last 12 months. There have been 19 requests to Council to investigate reports of tree poisoning in the 12 months prior. 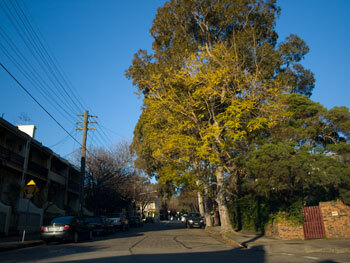 Marrickville Council also said it does not consider tree poisoning to be a major issue in the area. I thank the Inner West Courier for sharing this information. I was shocked when I read this. 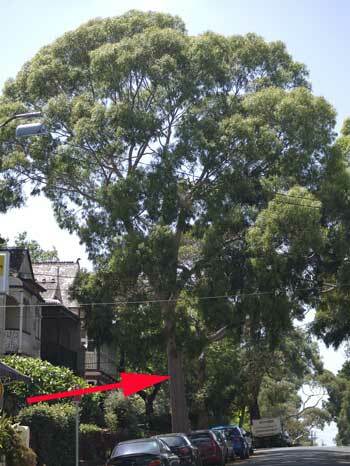 How can Marrickville Council not consider the poisoning of 28 trees across Marrickville LGA to be a major issue? Is it because they think the numbers are low or because they have greater issues regarding trees to deal with? How many other trees were poisoned, but not reported? Quite a few people will not be prepared to report on their neighbour. I am presuming that the 28 trees poisoned were large trees. 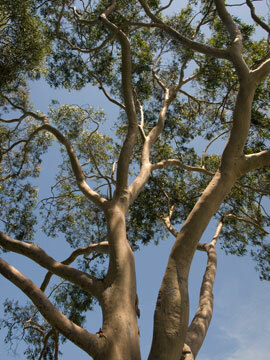 Large trees can be worth thousands of dollars to Councils in green infrastructure. 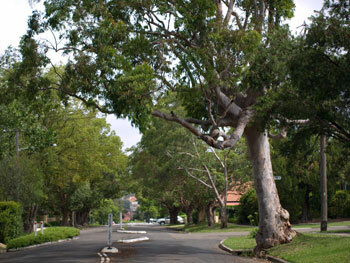 Many Councils consider trees to be major assets & even give them a dollar value. When people refer to the ‘Leafy Suburbs,’ they are connecting an environment that has a significant green canopy to big money & financial affluence. People with money like to live in areas that are beautiful & trees provide this. Areas with few trees are regarded as poorer, less desirable places to live. Any real estate agent will say the same thing. Taking this into consideration & the fact that it takes decades for a tree to grow to a significant size & provide the most use to the community & the environment in terms of stormwater uptake, erosion management, carbon sequestration, pollution capture, oxygen production & other things, how can the loss of any tree by vandalism not be regarded as a major issue? Any tree lost is a loss to the community. Some mature trees do have to go because of disease & decline, but a healthy tree to be secretly poisoned is unnecessary loss caused solely by the selfishness of one to another. Ian Moss is grieving for a tree that was not on his property. He could only see the tree. This shows that people connect to trees in the street, in the gardens of others & on the horizon. If you are like me you will have favourite trees that you always look at when you drive past even thought the tree is far away from your home. In this house we often say that we are almost home because of the trees that we pass. The vandal did not improve things for anyone else, but themselves. 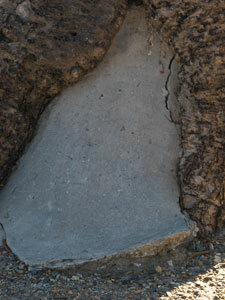 Back in February 2011 Waverley Council took a man to court because they could prove that he vandalized a tree. He received a hefty $19,000 fine. I can bet that almost everyone in Waverley LGA knows that they take on a huge risk if they damage trees. 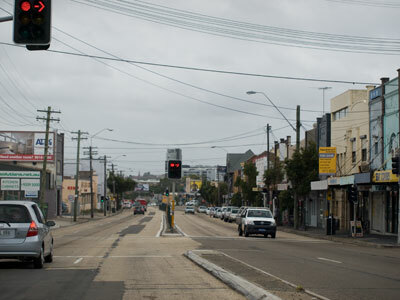 This is the same for Leichhardt LGA where a friend repeatedly says, “You wouldn’t get permission to remove that tree here.” Yet, here in Marrickville LGA, by Council’s own admission, 95% of requests to remove a tree are processed with a tick, even when it is significant, historic streetscape & habitat for a critically endangered native animal. 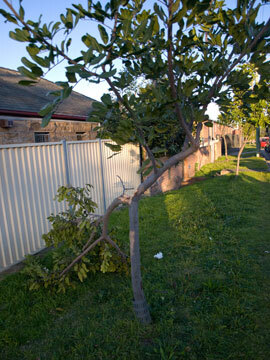 In Leichhardt LGA trees are not removed if they drop branches. 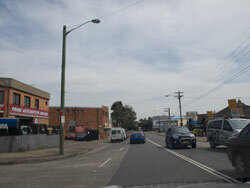 They often are in Marrickville LGA. On 2nd September 2010 a news item in the Toronto Star titled ‘Tree-lined streets not worth the cost, arborists say’ caused a bit of an uproar on the net amongst people interested in trees. The article was discussing the problem of street trees in Toronto. 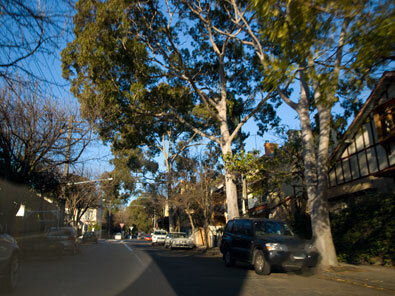 For me it was a good read in that it showed me that problems with the management of street trees are happening elsewhere & that trees in Marrickville LGA generally get a better time of it than those in Toronto. Well the first question I had was, “What happened to their roots?” but this was not answered in the article. 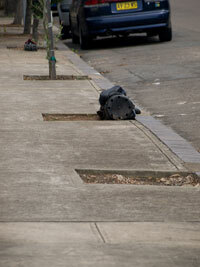 I’ve watched a street tree planted here by Marrickville Council staff & all the roots were planted along with the tree. The tree is still growing & didn’t go into shock even though it is in a concreted space, under an awning & the said tree lost a number of its branches. Here is a very big difference. Street trees in Toronto are cared for & watered for 2 years. Here they are watered once a week for 12 weeks. I know for a fact Marrickville Council would be overjoyed if residents & business owners helped by watering the street tree outside. Toronto Tree Managers would prefer to plant trees in the city’s ravines as they mostly survive there. Although they see street trees as a waste of taxpayer’s money, they acknowledge that the streets would be bare without them. Now they are trying to deal with the problem by establishing maintenance plans over a 10-year period that includes pruning. As well as watering the street trees regularly they feed them with compost tea (so easy to do) & mulch. Meanwhile scientists, planners & engineers gathered for the National Tree Symposium at Adelaide University. They were discussing the latest methods to increase the urban tree canopy, including methods to direct stormwater to street trees rather than the age-old loss of this water down drains. Perhaps it’s the weather. Toronto has lashings of snow, while most of Australia bakes & it is getting worse. Last summer there were many heat-related deaths in Adelaide & Melbourne. There is justified fear that summer heat-related deaths will happen again or develop into the norm because of increased temperatures due to global warming. Tree & urban planning specialists know we need to increase the canopy as fast as we can & importantly we need to maintain it. That street trees are only expected to last 5-10-15 years in modern-day tree management is to my mind crazy. It’s crazy because with a few simple changes, street trees can live for decades. 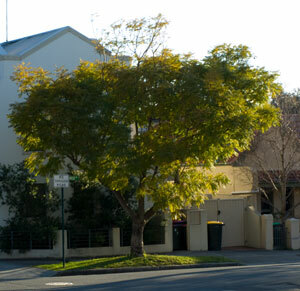 We have many examples of old trees living happily across Australian cities, including throughout Marrickville LGA. It costs money to buy trees, to plant them & to chop them down. I’ve said before trees are the only infrastructure Council has that increases in value. We need to let them grow not only for the beauty they bring, but also because trees drop the need for power use (especially cooling), their shade lengthens the life of footpaths & roads & they have a major psychological effect on human happiness amongst many other things. I will write about ideas that experts have to help street trees live longer in another post. 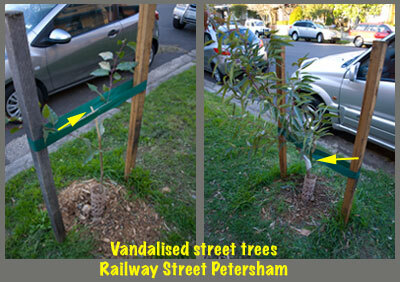 I have discovered 2 new examples of tree vandalism, one in Petersham & one in Marrickville. 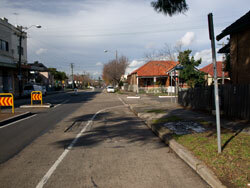 Council recently planted a number of new street trees in Railway Street Petersham. Two of these trees have been snapped in half. One has been sticky-taped together by a kind person who is probably hoping it will graft together. A couple of residents came out to speak to me & pointed out the damage. They are concerned that Council won’t replace the trees. 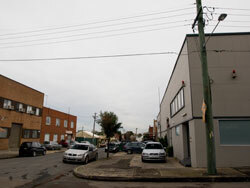 The other is a Tuckaroo in Myrtle Street Marrickville that has been growing for 2-3 3-4 years. It has 2 main branches & one has been snapped off. The site of the tree on the side of the road with no footpath & pedestrians as rare as hen’s teeth indicates it was done maliciously & not an accident. I recently read a report from a Tree Manager of an American Council who, when disputing the power company’s right to remove a tree, said “It is 26 years of deficit you will be creating here.” I have not read or heard anyone refer to tree loss in this way before. What he means is, it took 26 years for that particular tree to grow & to remove it means a loss of 26 years. It’s the same for all the tree vandalism done by mischievous people & careless truck drivers. Removing trees is easy. Replacing trees is easy. 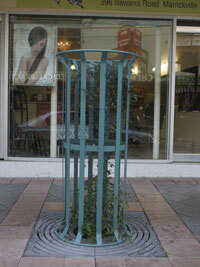 Growing is not so easy as urban trees have to overcome many obstacles to survive. The saplings in Railway Street Petersham haven’t been growing long, but it may take Council a long time to replace them. The young tree in Myrtle Avenue has been growing for 3-4 years. Now it is destroyed. That’s a 3-4 year deficit. Makes sense to me. 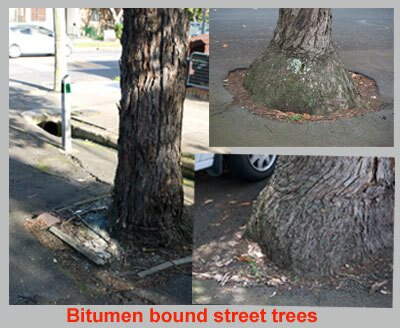 In Melbourne, they are talking about how their 100-year-old trees are “an extremely valuable asset” while Marrickville Council talks about our older trees as “senescent” & past their time. You may remember earlier this year Marrickville Council put up a plan before the Councillors to remove many of the old trees over the next 5 years. The designated amount was 1,000 trees to be removed per year for 5 years targeting senescent trees. Thankfully the Councillors did not accept this Tree Strategy Issues Paper, but it was a close call & a revised Paper will be returning for consideration soon. tree like that closer to home along the beachfront at Brighton-le-Sands. A few of the tall pines had substantial holes in their trunks. Rather than chopping them down, Rockdale Council had the rot treated & the hole cemented allowing the tree to remain stable & continue to live for the benefit of the community. I would imagine those trees are heritage listed. When I was a child, it was quite common for a Tree Surgeon (as Arborists were called then), to be employed to save trees on private property. I remember watching them scrapping out the hole, using chemicals to stop the disease & filling the hole with cement, just like a dentist fills dental caries. I saw trees bolted together if they had a split in their trunk & other such things that seem to be out of vogue today. Nowadays, the simplest intervention seems to be to cut the tree down saying “everything has to die.” True, but many tree species live far longer than what we are led to believe. Melbourne is proof of this. crossed. Already around the municipality there are trees dying. Some of them were stunners that now stand brown & present a danger of falling, damaging property & perhaps a risk to life. I find it sad as many of these tree deaths could have been averted if they had been watered. 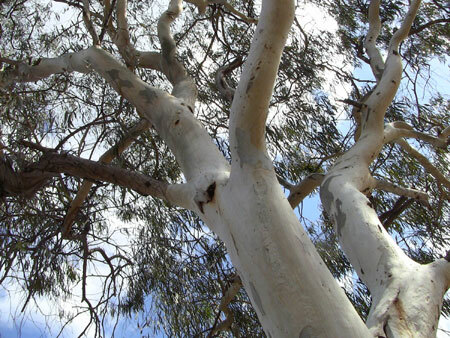 Another article in the same vein that may be of interest says Adelaide City Council is considering putting a dollar value on its trees following in the footsteps of Melbourne. This may lead to developers being required to compensate for the trees they say they need to chop down by planting trees to that dollar value. So if trees are valued at $100,000, they will be required to plant trees to that value. I’m hoping it may bring business to those tree companies who are skilled at large tree relocation. Relocation costs may actually be cheaper than paying for the trees that would be lost if chopped down. 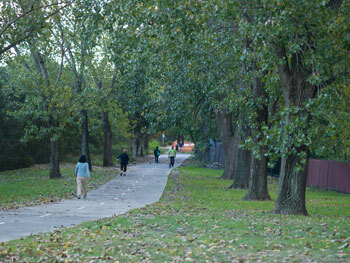 This beautiful tree-lined walk along the Cooks River offers respite from the city's hectic life. The tall trees which make this section special.